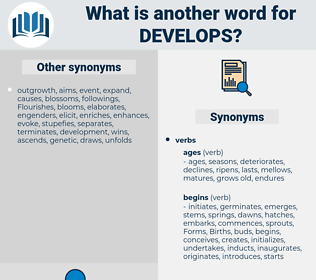 What is another word for develops? drafts, rises, sets, requirements, charts, initiators, puts, frames, designs, elaborates, development, developing, preparations. 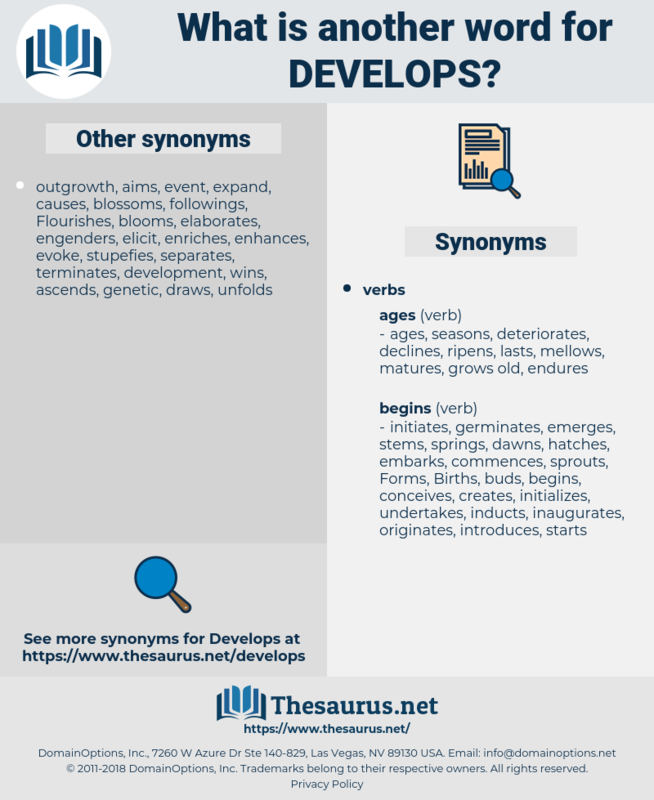 devises, progresses, deepens, consolidates, explores, delivers, expands, provokes, demonstrates, compiles, constructs, derives, delineates, devotes, enlarges, broadens, conceives, proves, proceeds, opens, possesses, grows, exploits, generates, introduces, bolsters, acquires, describes, Flourishes, incorporates, empowers, outlines, engenders, enhances, organizes, moves, orchestrates, exists, propose, proposes, allocates, declares, advocates, acknowledges, stimulated, stimulates, distinguishes, thrives, administers, shapes, adopts, spreads, characterizes, oversees, stipulates, constitutes, assembles, leads, PAVES, governs, poses, Loves, des, imposes, illustrates, perceives, exposes, contributes, publishes, organises, pursues, convenes, converts, POPS, enjoys, holds, nurtures, boosts, facilitates, emerges, initiates, activates, operates, invents, conducts, protects, widens, concludes, processes, employs, installs, unfolds, translates, purchases, decide, exacerbates, amplifies, transpires, foments, comprises, is, dedicates, obtains, explains, repels, substantiates, sustains, considers, handles, occurs, becomes, emphasises, recognises, emphasizes, invests, prescribes, simulates, extends, Scales, arranges, erupts, originates, enforces, owns, lies, performs, Comes, draws, pushes, matures, classifies, issues, spends, equips, product, lays, manages, embodies, calculates, configures, expresses, maintains, involves, summarizes, realizes, breeds, doubles, feeds, presents, augments, authorizes, arises, trend, trends, displays, continues, submits, ascertains, regulates, tightens, envisages, arrives, Manifests, recognizes, aileges, examines, understands, realises, undertakes, works, entrenches, looks, enables, Plays, deals, compounds, underscores, exhibits, captures, commits, earns, underlines, engages, likes, contains, launches, views, accrues, exerts, finds, helps, executes, enacts, adds, fuels, boasts, embraces, postpones, assigns, Drives, fulfils, asserts, entitles, underpins, settles, reviews, varies, covers, assumes, believes, happens, teaches, ensues, surfaces, clarifies, handicaps, assesses, paints, SITS, secures, dictates, fulfills, feels, reveals, serves, ensures, argues, Waits, hosts, lists, favours, sponsors, stems, pits, insures, enshrines, directs, Addresses, highlights, regards, ranges, causes, Carries, reads, tells, brings, stores, passes, keeps, hits, reiterates, agrees, springs, change, changing, changes, stands, consists, Permits, mounts, Does, affirms, enters, mixes, buys, raises, shows, Gives, relates, spins, fix, fixes, allows, seems, caters, entails, seeks, begins, discusses, shifts, rig, rejects, Has, features, favors, turns, starts, aims, goes, cares, Focuses, sees, takes, assists, drafts, rises, sets, lets, gets, makes, runs, charts, puts, thinks, frames, sheds, produce, produces, elaborates, defining, improves, identifying, fosters, encourages, form, Forms. implements, reinforces, reinforcing, designs, provide, development. Unless civic responsibility develops beyond this comparatively helpless position, no such improvement of the situation as may lead to dramatic growth may result from this foundation.
" Perhaps," answered Catrina; " and when the miniature develops it loses the delicacy which was its chief charm." devolve, DFLP, diplopia, double up.